The Riad Sidi Magdoul is situated in heart of the Medina of Essaouira, near the beach and souks. It is a bright and comfortable Riad, which offers calm and quietness only a few metres from the busy pedestrian streets of Essaouira The Blue. 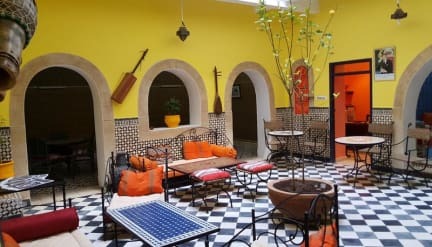 The Riad is made of ten rooms placed on three floors around a large 'puits de jour', an open space in the centre of the Riad from which the light pours in. A bright and sunny terrace offers a view on the roofs of the Medina. Wireless internet connection (WIFI) is freely available. The Riad Sidi Magdoul is located just a few steps from the picturesque port (parking with municipal attendant) and the vast beach, in the heart of the artistic and artisan neighbourhoods of the Medina, souks, restaurants, galleries, cafes. We remind you that we offer individually negotiated taxi fares to all the major cities in Morocco (Agadir, Casablanca, Marrakech). A very beautiful place with a nice roof terrace and a friendly staff. The breakfast was good and we felt comfortable staying here. The shower was cold though but besides that we were very satisfied.